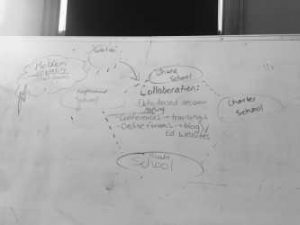 “We fixed the education system”, my classmate exclaimed during our group discussion on Tuesday. Later in the week, we found out that our “solution” to the education system in the U.S was closely related to market theory, and that has a lot of issues in and of itself. We have been aggressively looking for answers through debates and questioning. Every day, our class has a new set of discussion leaders. Their job is to lead the class in thoughtful and productive conversation. So far, this is one of my favorite things about the class. Every day, we gain a new perspective on how to question our current system because we have different people every day questioning us. Today in class, the discussion leaders wanted us to work in a pair to create thought diagrams relating to a theme and set of questions. Their only instructions were to look at the questions and create a visual. The options were endless on how each group wanted to present their set of questions. Through this process, we came up with potential solutions to inequality in schools. My partner and I focused on collaboration among schools to reach a more unified form of educating. We identified forms of collaboration that are already implemented but could be used in a greater magnitude to be effective in unifying education. Data-based decision making, teacher and administrative conferences that focus on training, and online forums (blogs) could all be used in this manner. Another group focused their thought diagram on innovation as a way to resolve inequality. An idea this group had was to put more importance of qualitative data in conjunction with quantitative data. An example they gave of qualitative data used in schools was student testimonials. One group dealt with a difficult question about who has the right to choose a child’s education. 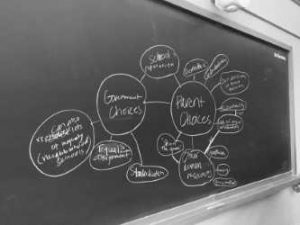 Their thought diagram expressed the benefits and consequences of government choice and parent choice. One of the benefits to government choice is standardization, but parents have more “skin in the game”. A consequence to making only parents accountable for choosing their child’s school is that information is power. Families with higher socioeconomic status have more access to information, and this process reproduces inequality. 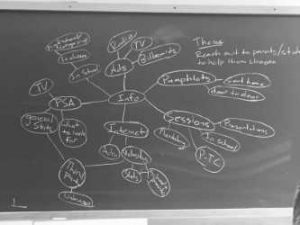 Because families with higher socioeconomic status are privileged due to their access to information, another group worked on how to get the information about choosing schools to all parents. This group believed that it was essential for the schools to reach out to the parents besides the parents having to seek out information for themselves. Their main categories for getting information to parents included ads/pamphlets, sessions, the internet, public service announcements, and information given in class. I enjoyed making thought diagrams as a brainstorming process. The activity produced great conversations and debates. Hello, everyone! My name is Harley Guzman, and I am a sophomore. I was born and raised in South River, New Jersey where I enjoyed motorcycle rides on the highway with my dad and buried my siblings in sand at the beach. 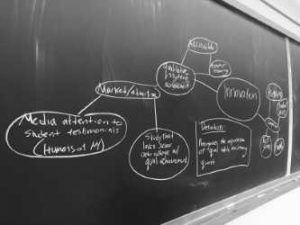 I am a Sociology major, but I am also interested in the disciplines of Linguistics, Classics, and Education. I like hiking, playing rugby, and reading feminist manifestos. Also, I love to write, and that's why I'm here: hopefully, to inform and entertain you, through my blog posts, about SO280 Sociology of Education.